Reader Michelle shared this article with me and I had to pass it along. It's an amazing story and reminder especially at this time of year. Don't worry. It has a happy ending:-). Thank you, Michelle, for sharing. When we got home, we talked about what we could do. We decided to buy 50 pounds of potatoes and live on them for a month. This would allow us to save $20 of our grocery money for the offering. When we thought that if we kept our electric lights turned out as much as possible and didn't listen to the radio, we'd save money on that month's electric bill. Darlene got as many house and yard cleaning jobs as possible, and both of us babysat for everyone we could. For 15 cents we could buy enough cotton loops to make three pot holders to sell for $1. 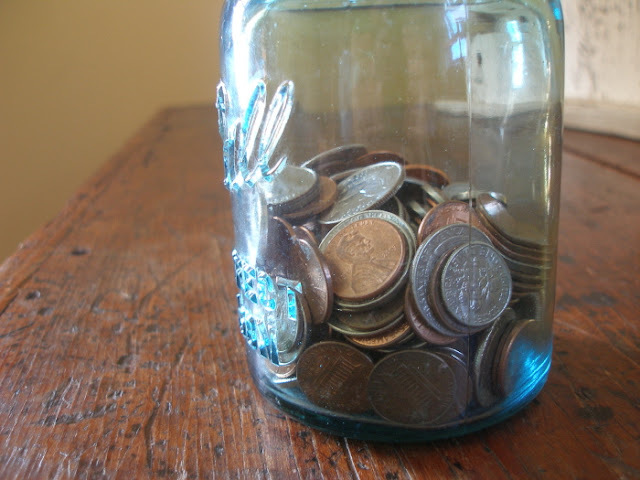 Every day we counted the money to see how much we had saved. At night we'd sit in the dark and talk about how the poor family was going to enjoy having the money the church would give them. We had about 80 people in church, so figured that whatever amount of money we had to give, the offering would surely be 20 times that much. After all, every Sunday the pastor had reminded everyone to save for the sacrificial offering. That night we were so excited we could hardly sleep. We didn't care that we wouldn't have new clothes for Easter; we had $70 for the sacrificial offering. We could hardly wait to get to church! On Sunday morning, rain was pouring. We didn't own an umbrella, and the church was over a mile from our home, but it didn't seem to matter how wet we got. Darlene had cardboard in her shoes to fill the holes. The cardboard came apart, and her feet got wet. As we walked home after church, we sang all the way. At lunch Mom had a surprise for us. She had bought a dozen eggs, and we had boiled Easter eggs with our fried potatoes! Late that afternoon the minister drove up in his car. Mom went to the door, talked with him for a moment, and then came back with an envelope in her hand. We asked what it was, but she didn't say a word. She opened the envelope and out fell a bunch of money. There were three crisp $20 bills, one $10 and seventeen $1 bills. Mom put the money back in the envelope. We didn't talk, just sat and stared at the floor. We had gone from feeling like millionaires to feeling like poor white trash. We kids had such a happy life that we felt sorry for anyone who didn't have our Mom and Dad for parents and a house full of brothers and sisters and other kids visiting constantly. We thought it was fun to share silverware and see whether we got the spoon or the fork that night. We had two knifes that we passed around to whoever needed them. I knew we didn't have a lot of things that other people had, but I'd never thought we were poor. That Easter day I found out we were. The minister had brought us the money for the poor family, so we must be poor. I didn't like being poor. I looked at my dress and worn-out shoes and felt so ashamed—I didn't even want to go back to church. Everyone there probably already knew we were poor! I thought about school. I was in the ninth grade and at the top of my class of over 100 students. I wondered if the kids at school knew that we were poor. I decided that I could quit school since I had finished the eighth grade. That was all the law required at that time. We sat in silence for a long time. Then it got dark, and we went to bed. All that week, we girls went to school and came home, and no one talked much. Finally on Saturday, Mom asked us what we wanted to do with the money. What did poor people do with money? We didn't know. We'd never known we were poor. We didn't want to go to church on Sunday, but Mom said we had to. Although it was a sunny day, we didn't talk on the way. Mom started to sing, but no one joined in and she only sang one verse. At church we had a missionary speaker. He talked about how churches in Africa made buildings out of sun dried bricks, but they needed money to buy roofs. He said $100 would put a roof on a church. The minister said, "Can't we all sacrifice to help these poor people?" We looked at each other and smiled for the first time in a week. When the offering was counted, the minister announced that it was a little over $100. The missionary was excited. He hadn't expected such a large offering from our small church. He said, "You must have some rich people in this church." We were the rich family in the church! Hadn't the missionary said so? From that day on I've never been poor again. I've always remembered how rich I am because I have Jesus! That's a neat story, and a good reminder of true wealth, but I don't get the last line. It doesn't seem relevant to the story, plus, it opens up a whole other kettle of worms (fish?) (oh wait, it's a CAN OF WORMS and a KETTLE OF FISH, geesh), like the idea that we can own Jesus. All throughout the story, she talks about the "sacrificial" offering and I took her to mean that because of Jesus' sacrifice, they, too, wanted to give sacrificially. She's rich because of the gift He gave her (salvation). And I don't think that the final line is irrelevant. The whole story centers around church and don't we go to church because of Jesus? Just my thoughts on the matter:-). Jennifer Jo...no,,,we can't own Jesus,, but we can have him in our heart and lives....there is room enough for all...He is a big God. It is sad when we look at ourselves through others eyes. But when we look at ourselves through the eyes of our Almighty Savior, we are as he sees us. Beautiful, worthy, righteous, loving, kind, joyful, hopeful and rich in him who was our sacrifice. Sometimes I think it is the "poor" people who give the most. Thanks for posting this beautiful story! I loved it. So many messages there. What a great story! What struck me was, this 'poor' family had raised $70 on their own, and the church family had only given $17 ((Am I doing my math right?)) That was convicting to me; I would be one of those who would only give a dollar b/c I thought I couldn't "afford" more. Thanks for sharing this story. How true are the simple things. And how simple are the true things. The definition of "richness" depends upon which dictionary you use: If God's dictionary, richness means having His Christ as our Savior. If man's dictionary, richness means having earthly possessions. Amazing! Had any of those other "givers" considered that "they" were the poor ones, I wonder if they'd have given more in order to receive more! It seems to me that the last line is the most relevant one! The point of this whole message (to me) is that keeping the right focus on our "riches" prevents us from thinking "we" are the poor ones. For if we have Christ as our Savior, what need we more? Thank you for a wonderful reminder that "money" is not the constitution of "riches in Christ." I just found your blog and have been devouring it. This story touched me on so many levels. I cannot express it, but I appreciate it and so many of the things I have read so far. Blessings! I just love this story! What wisdom! wow this is an awesome story and a great reminder of what it means to be rich. Thank you it blessed me. Great story! Just found your blog for the first time through pinterest. Thank you for your ministry. I'll be visiting often! I remember going to church with my father's parents. "We" (being my twin and myself, very noted in that side of my family that we were my MOTHERS daughters) were not the better off side of the family. My father's parents were. Mom would send us to church with $5 or more from her tips at the cafe. My Father's parents only ever gave us a quarter for the offering plate. Didn't really think about that till now. I'm blessed to have such a good Mom. I understand that it is very patronizing to help others who actually don't want or need assistance. However, there are times when it is okay to accept help and still keep your dignity. I celebrate your son's restored health, the kind folks who helped you out and your family for letting them help you. You're absolutely right- there are seasons of helping and of accepting help. Blessings to you as you enjoy your family and pass it on:-). I recently discovered your blog & have been reading through your 'Living Simply to Give' posts. I wondered if this is a true story? It's beautiful & has such a good lesson but it sounds a lot like the feel-good stories that are passed through the internet these days even though there seems to be truth in it as well. Is there any way to confirm it before I share it? I grew up in poverty as well in rural Appalachia in the 1960's. I think church families made me feel poorer than anyone else I knew. I love what one commenter here said, "It is sad when we look at ourselves through others eyes. But when we look at ourselves through the eyes of our Almighty Savior, we are as he sees us. Beautiful, worthy, righteous, loving, kind, joyful, hopeful and rich in him who was our sacrifice." Thank you for your comment, Jenny. I provided the link above (just below the title)- you can look into it further to see if you can determine its origin. I am so sorry that you and your family didn't receive the love and acceptance from your church when you were young. May we all learn from stories like yours and DO better. Blessings to you. I am always humbled by how the lord reminds us of how much we have. I am happy to have found your blog and another beacon of the Lord's light through you. What a beautiful story! I just realize I just got here 5+ years after this is posted. I feel blessed to have found your site. Thank you.